Karlsruhe, Germany, November 9, 2017 – Today EIZO GmbH announced the release of a new 49-inch wall-mounted monitor for the operating room (OR). 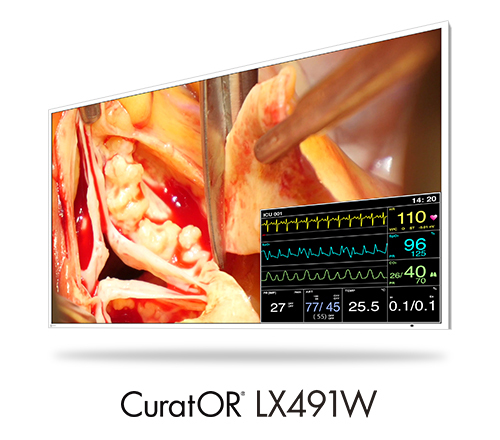 The CuratOR LX491W is a widescreen monitor with full HD resolution and is ideally suited for viewing medical images (X-ray, CR, MRI, and endoscopy). The LX491W has updated the connectors and added functions to the LX490W predecessor model. The HD-SDI input has been upgraded to 3G-SDI on the LX491W. As a result, the monitor supports an expanded spectrum of timings and has been optimized for the signal requirements of the modern operating room. Together with its wide range of input and output connectors, the monitor can be used in a variety of ways with established imaging systems. In addition to the functions from the previous model, the LX491W offers the Force Mode function. This function enables the monitor to adapt to signals with unusual timings from installed legacy systems. With the user-defined look up table (LUT), the default gamma model, color coordinates, and brightness of the LX491W can be adapted to individual requirements without additional sensors and software. This simplifies adjustments in the field, particularly when replacing older monitors. Like its predecessor, the LX491W has five gamma models calibrated at the factory, as well as a user-defined LUT function that helps to quickly adapt the monitor to the local environment and application needs. The Picture-in-Picture (PiP), Picture-and-Picture (PaP), and source preview Picture-over-Picture (PoP) functions make it possible to simultaneously display multiple source images on the monitor. The LX491W has an extremely bright LED backlight offering luminance up to 700 cd/m². The integrated stability system keeps the calibrated brightness constant. With 1300:1 contrast and a 178° viewing angle, medical professionals are offered clear of images from almost any position in the operating theater. Visitors can see the new monitor from November 13 to 16 at the EIZO booth in Hall 10, stand number H41 at the Medica 2017 trade show in Düsseldorf, Germany. The LX491W will be shipping in the first quarter of 2018. The date of availability may vary by country, so please contact the EIZO group company or distributor in your country for details. EIZO GmbH is based in Karlsruhe, Germany and is a leading manufacturer of visual display solutions for medical imaging applications. The company portfolio includes color and grayscale monitors of 1 to 8 megapixels, video management systems and related accessory products. EIZO GmbH is a subsidiary of EIZO Corporation, a global leader in the manufacture of high end monitors for medical and graphic design applications, financial trading, and other markets. EIZO and CuratOR are registered trademarks of EIZO Corporation.